We bring you last week's top former Coyotes players who are currently playing in pro basketball. #1. Experienced Brandon Brown (6'7''-PF-85, graduated '09, plays pro in South Korea) led KCC Egis to a victory over the closely-ranked DB Promy (19-21) 98-92 in the South Korean KBL last Sunday. Brown was MVP of the game. He had a double-double by scoring 36 points and getting 21 rebounds. Brown also added 8 assists in 41 minutes. KCC Egis (20-20) are placed fifth in the KBL. It's Brown's first season with the team. He has individually a very good year with high stats. Brown averages 25.4ppg, 13.0rpg, 3.6apg and 2.0spg in 40 games he played so far. He is a former Eurobasket Summer League player, which is considered top international summer league in the market. #2. Kwame Alexander (6'7''-F/C-90, graduated '13, plays in Chile) was the major contributor in an AB Ancud's victory against the third-ranked Universidad de Concepcion (15-12) 81-75 in the Chilean Liga Nacional on Sunday night. 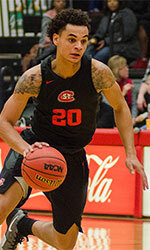 Alexander recorded a double-double by scoring 21 points and getting 10 rebounds. It was the game of the round between two top 3 ranked teams in group Conferencia Sur. Asociacion Basquetbol Ancud (0-2) is placed first in Conferencia Sur. There are only four games left until the end of the Regular Season. So now every game will be critical. Alexander has relatively good stats this season 13.5ppg, 10.0rpg and 1.7apg. #3. 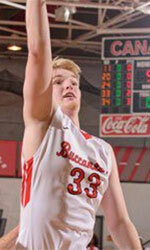 Theron Laudermill (6'8''-PF-89, graduated '12, currently in Mexico), who plays in the Mexican LNBP (second division) could not help Correcaminos UAT Victoria (14-19) to beat Mineros (25-10). He recorded 7 points and grabbed 5 rebounds in 23 minutes. The fifth-placed Correcaminos UAT Victoria (14-19) was badly defeated 95-76 on the road by the second-ranked Mineros in the North group. It was Correcaminos UAT Victoria's third consecutive loss in a row. Laudermill has very impressive stats this year 16.5ppg, 9.5rpg and 1.5bpg in two games. Laudermill is a former Eurobasket Summer League player, which is considered top summer league for players who want to play basketball overseas. #4. Anthony January (6'8''-F-93, graduated '16, plays pro in Lithuania) was not able to help Ereliai Mazeikiai in their game against Zalgiris II (16-15) in the Lithuanian NKL (second division). January's contribution was not very remarkable in Saturday's game. He recorded only 2 points and grabbed 7 rebounds. The sixth-placed Ereliai Mazeikiai (10-21) was defeated 87-75 at home by the leading Zalgiris II in the Places 9-15 group. This season January averages 0.7ppg and 2.7rpg. #5. Robbie Robinson (6'5''-G/F, graduated '12, plays in Canada) contributed to an Island Storm's victory against the Saint John Riptide (6-17) 115-111 in the NBL Canada on Sunday night. Robinson scored 6 points in just 14 minutes. The Island Storm has rather weak 5-15 record this season. It was his team's first victory after four consecutive loses. It's Robinson's first year with the team. This season he averages 0.7ppg and 2.7rpg in three games.